Summary: This nicely priced set of inlines are light, strong, and fast. An excellent value for recreational or mild competition speed skating. I ordered a set of the Tour 890s before they were actually available. It took several months for the rink to get them in, so I was glad that they fit when I tried them on the first time! The boots are heat-moldable. Included with the skates are instructions as well as a small thermometer you can use in the oven to determine whether you are at the proper temperature. I went through this process with some success, but portions of the boots still rub my ankles, sometimes causing blisters. Also, the boot includes a ratchet mechanism for tightening the strap, and you have to push on the outer edges toward the skate to release it. You may want to learn how to do this before you put the skate on. The rails are a lightweight aircraft aluminum, but they feel quite strong. The included wheels are 80mm Kryptonics Allez, which I had on my previous inlines. They seem to fit in exactly with the purpose of the skate: recreation or mild competition. The bearings are Bevo ABEC-5. The bolts holding the wheels in place screw directly into the rail and include some Loctite on the threads. Since they screw into the rail, be certain not to overtighten them, or you could strip the rail. With Loctite on the threads, you shouldn't have any problems, and it's probably a good idea to put more on when you do remove the wheels. Included with the skates is a T-handle hex wrench, an extra bolt for the wheels, and an extra bolt for the rail mount. The hex wrench has proven much more useful than you'd expect from a tool they throw in with the skates. It just seems to work better than standard hex wrenches, because the shank is the perfect length for adjusting the bolts holding the rails, whether you are wearing the skate or not. The wrench also works on the wheel mount bolts. The skates are strictly meant for indoor use. No brake is provided, and I doubt the aluminum rails would look very nice after a single fall on concrete. As you can see from the picture above, the Tour 890 styling is bold and unique. I've noticed many people checking them out like they were a sports car. I wasn't sold on the blue wheels mixing with red, yellow, and black colors, and it hasn't really grown on me. Still, I don't think it's ugly, just unmatched. 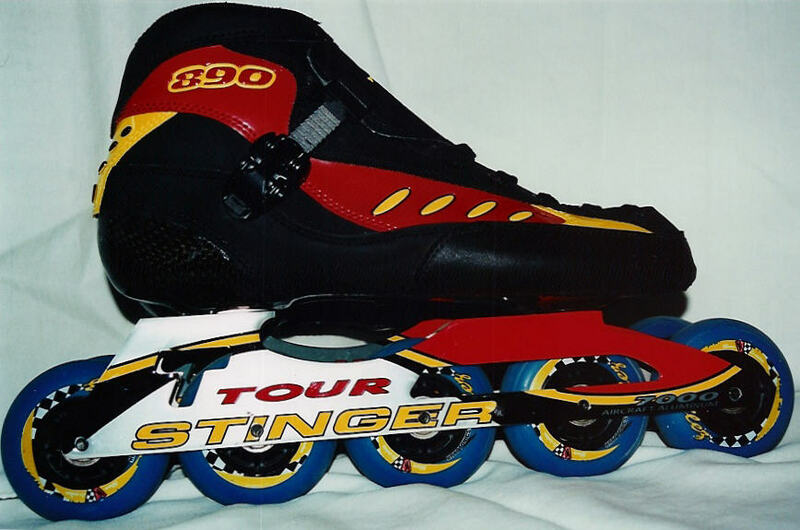 Like other inline skates, these ride very smoothly. At the same time, they feel tight, like natural extensions of your feet, and they don't have any flex or play. With that combination, you have predictability, which means you can go very, very fast on them. I doubt I've set any speed records, but it's me that's running out of steam, not the skates. They feel solid and reliable all the way up to my top speeds, in both long runs and short sprints. I'm happy with my purchase, and I'd recommend the same skates to others who are looking for a quality pair of inline speed skates.